Damn good vegan food is what fuels this Freeheel Vegan! At the bottom of the page, I’ve included my most recent blood test results (Vitamin B12, Vitamin D, iron, and lipid panel) and my weight trend. Green smoothie with orange, banana, kale/collard leaves, celery, avocado, pineapple, blueberries, pea protein powder, hemp protein powder, and flax. Walnuts, pistachios, macadamia nuts and/or roasted cashews (~2-3 oz). Organic firm tofu (3 oz), seasoned with tamari and Frank’s hot sauce. Romaine leaves, carrot or red pepper and 6 cherry tomatoes. Strawberries, blueberries, or cherries (in season). 2 Brazil nuts & 1/2 oz unsweetened chocolate. 1 Pickle and 6 black olives. Homemade chili over boiled sweet potato. Steamed broccoli/cauliflower with sauerkraut and toasted pumpkin seeds. I eat raw dark leafy greens like kale or collards every day. I blend them in a green smoothie. I eat romaine or lettuce greens most days. I like the leaves plain, or I may have a salad. I eat cruciferous vegetables most days. Raw would be optimal, but most of the time I steam broccoli or cauliflower. I save the broccoli stem to put in smoothies. I eat cabbage raw more often than cooked. I eat plenty of other vegetables not mentioned above. I eat potatoes a couple times per week. I cook with plenty of mushrooms. I eat fresh fruit every day. I eat a little dried fruit (mostly prunes but occasionally a date or fig). I add 1 tablespoon full fat coconut milk to my espresso, occasionally. I cook with coconut oil. I eat 1/2 avocado daily in my breakfast smoothie. I occasionally eat green or black olives. I use olive oil in salad dressings. I eat beans/legumes every day. I use tempeh and tofu in recipes weekly. Occasionally, I eat steamed edamame with a little salt and pepper, for a high protein snack. I add 1/2 tablespoon of pea protein powder to my green smoothie. I eat unsalted nuts, about 2-4 oz per day. In addition, I eat 2 brazil nuts for selenium and several walnuts for omega 3. I eat nut butters daily, typically 1 tablespoon peanut butter and/or 1 tablespoon almond butter. I add about 1/2 tablespoon ground flax and 1/2 tablespoon hemp protein powder to my green smoothie. I limit grains to about one meal per day. I limit foods made from flours, including things like dry cereals, breads, pasta, tortillas, chips, crackers, rice/corn cakes, etc, to about once per week, or when I go out to eat. I do eat gluten-based veggie meat (i.e. Field Roast) about once per week. I drink non-dairy milks with my espresso. I make homemade non-dairy milk using nuts and brown rice. I drink espresso every day. I buy organic, Fair Trade coffee beans. I home brew about 3 oz espresso with ground cinnamon, nutmeg, and cloves. I eat 1/2 ounce unsweetened 100% cacao chocolate per day. I have about one drink per night (or less). Dr Fuhrman’s Gentle Care Multivitamin, 5 days per week. DEVA 2400 IU Vitamin D2 or Plant Based 5000 IU Vegan D3, 5 days per week. 1000 mcg B12 lozenge, 5 days per week. 15 drops of liquid Dr. Fuhrman’s DHA + EPA, ~3 days per week. 2 teaspoon of Natural Calm (magnesium) in a glass of water, most evenings per week. Before baby, I had an active full time job as an Occupational Therapist in a nursing home. I was on my feet all day, moving around constantly, lifting patients and doing exercises with them. Currently I’m on leave from work so I’m at home taking care of baby Todd. I lift weights and do upper body and core resistance work 3 days per week. I do yoga 1 day per week. I walk with Todd in the stroller a 3-4 days per week. Before baby, I was a “weekend warrior”– i.e. 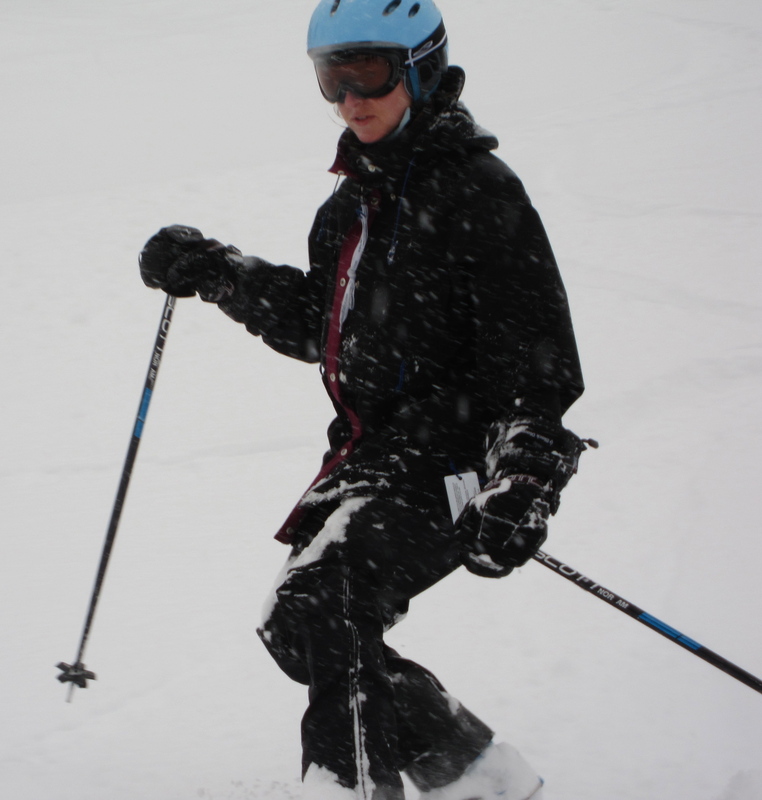 telemark skiing every Saturday and Sunday during ski season and mountain biking every weekend otherwise. I’d started doing some road biking, too. Before I discovered mountain biking in late 2008, I used to hike or backcountry ski every weekend when it wasn’t ski season (As indicated in my Trip Chronology). Post-baby, on the weekends, we ski (winter), walk and rollerblade (with baby stroller). We look forward to doing some road biking with Todd as soon as we get some gear. I love Pink’s muscles…totally inspiring! Thanks for details 🙂 Enjoyed reading this. Think I’m inspired!